In response to high-water conditions around Grass Lake, Snail Lake and nearby wetlands, the Ramsey-Washington Metro Watershed District is coordinating a large-scale flood study, currently underway. The goal is to identify strategies that will stabilize the system to withstand increasingly heavy precipitation and rebounding groundwater levels, ultimately protecting homes and property. The District contracted with Barr Engineering this summer to begin evaluating various flood control options. Meanwhile, District staff continues to closely monitor surface water and groundwater levels to gather additional data. Below is a summary of the work completed to date. Challenge: Snail Lake is currently landlocked without a managed outlet. High water has forced closure of the swimming beach, and while homes on the lake have not been impacted to date, an extreme rain event could potentially put low-lying properties at risk for flooding. Engineers surveyed the six lowest homes on Snail Lake to help determine a feasible 100-year flood level elevation for the lake. The team is now evaluating options for constructing a managed outlet system that could allow water out of Snail Lake if it were to reach this maximum level. Challenge: While Grass Lake’s water level fluctuates seasonally, its annual low point has been steadily rising since 2009. During periods of heavy rain in 2016 and 2017, the lake topped its banks on the north end, flooding trails and raising the water levels of nearby ponds and wetlands. 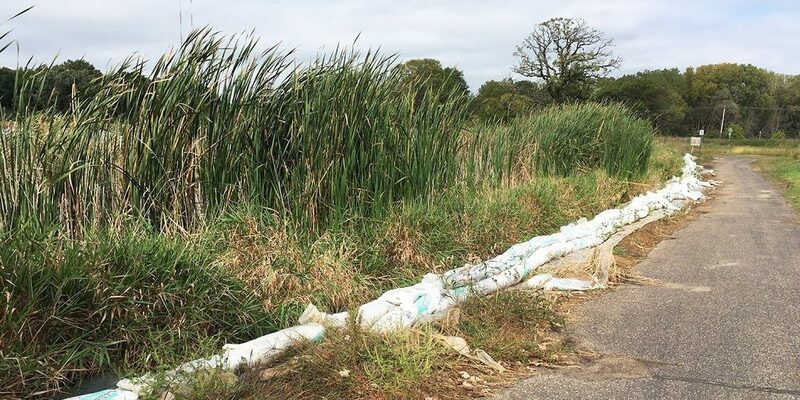 Two temporary sandbag berms have been installed along the north and northeast sides of Grass Lake. The engineering team took soil core samples at both sites and is now working to determine the proper design and elevation for permanent earthen berms, which could be completed by March 2018. In late March of 2017, the outlet channel from West Vadnais Lake (downstream of Grass Lake) was cleaned to promote drainage of the system. A similar project is planned for the Grass Lake outlet channel this winter. 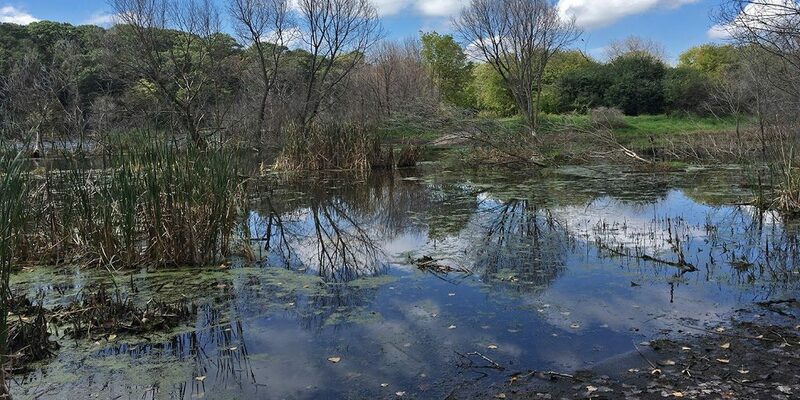 Challenge: Flooding from Grass Lake into adjacent ponds and wetlands, accompanied by seepage from high groundwater levels, has forced closure of several county park trail sections. Wetland A (pictured above), bordering the nearby Crestview Addition neighborhood, has been especially impacted as it is the lowest elevation point of the area and has no natural outlet. 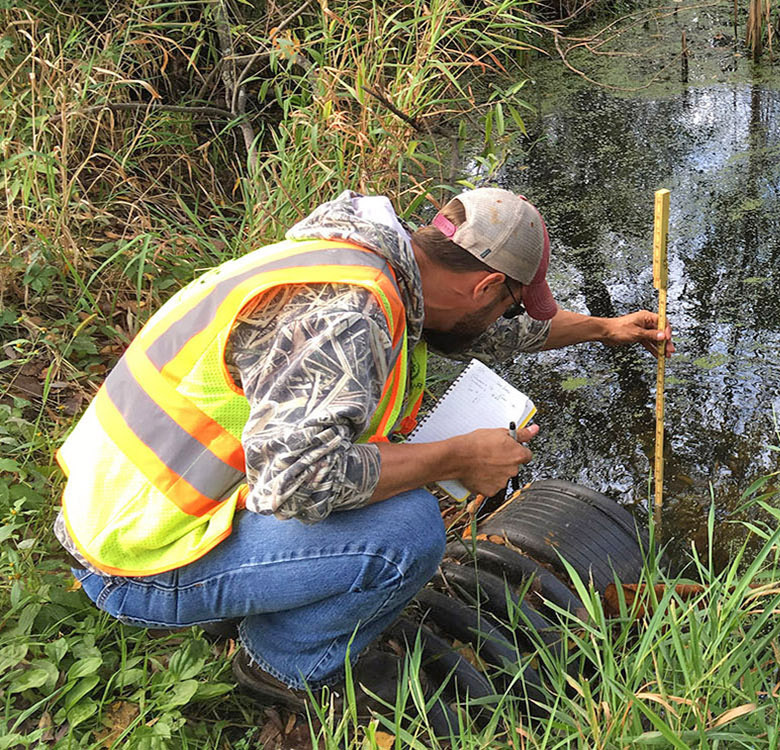 The District installed two new groundwater monitoring wells, which record automatic readings every 15 minutes, along with seven surface water level gauges at key points around Grass, Snail and West Vadnais lakes. Staff has taken manual on-site readings up to 3 times per week while also checking inlet/outlet pipes to ensure they are functioning as designed. In April, water was pumped out of Wetland A back into Grass Lake to see if this would alleviate high groundwater levels in the Crestview Addition neighborhood. Lowering the surface level of Wetland A had little effect on neighborhood groundwater. However, pumping other smaller ponds near Gramsie Road did have the desired effect of lowering groundwater and will be an important maintenance strategy in the future. 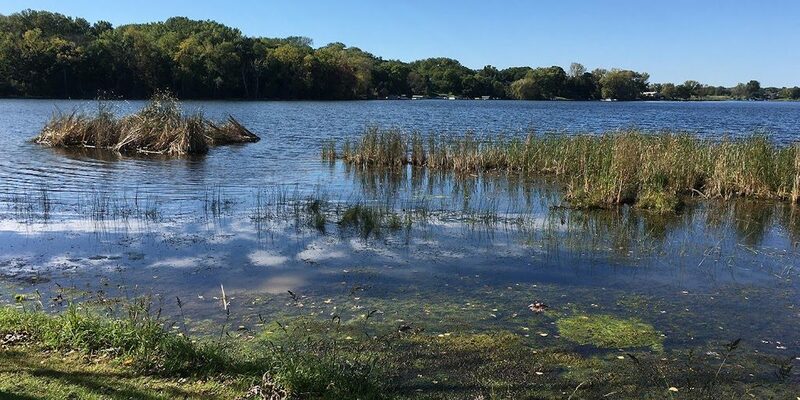 Once a peak flood level is established for Grass Lake and Wetland A, the District will advise Ramsey County on options for restoring trail access in low-lying areas of the regional park. The District is committed to finding long-term solutions to the flood risk in this area, including replacing/adding outlet pipes to increase drainage. However, this is a complex system with flood considerations downstream through the Phalen Chain of Lakes, so any projects designed to move water from one area to another will require further thoughtful consideration.